Yellow Bear Villa is great for your family’s next vacation! Parents, have a babysitter watch the kids while you go golf, get massages, and workout at the fitness center. For family time, take advantage of Punta Cana Resort’s water sports and activities, then come home to a gourmet dinner prepared by your private chef. Hop in the car and go down to the beach for an evening stroll, and cap off the night with an afternoon cocktail from Yellow Bear’s wet bar. 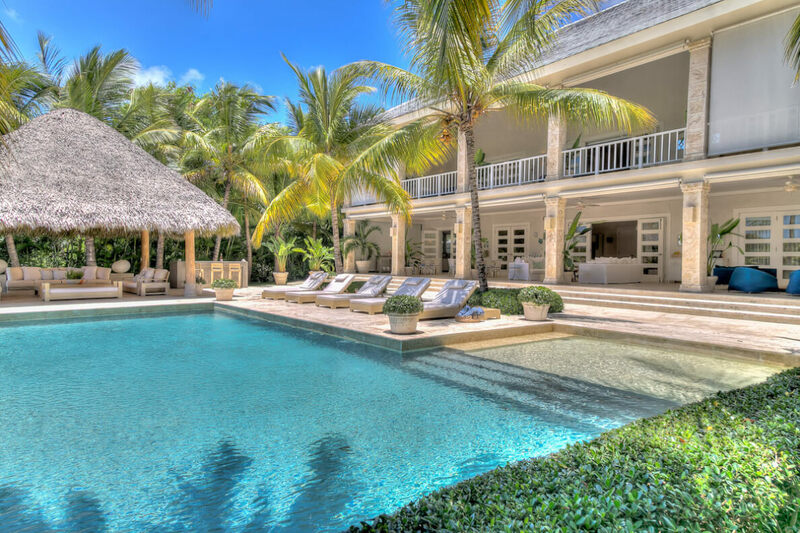 Yellow Bear Villa is a six bedroom villa located in a gated community in Punta Cana. This villa has views of the golf course and lush tropical gardens. Punta Cana Resort residents have access to sailing, windsurfing, kite surfing, snorkeling, scuba diving, and deep-sea fishing on the resort’s white sand beach and calm sea. The L-shaped pool has a beach area perfect for young swimmers, with lounging chaises along one side. A gazebo at the head of the pool shades outdoor seating, and a bar sits next to it under palm trees. On the covered porch, additional living and dining leaves guests ample options for entertaining. Ceiling fans keep the porch cool at all hours. Upstairs, the balcony’s vaulted roof shades two living areas and a small dining nook. Screens offer respite from the sun. The entryway features a staircase leading upstairs, an ottoman for lounging, and access to the living room. There’s a powder room off to the side, and the living room, with two couches and garden access, sits a few feet away. The dining table sits in between the living area and gourmet kitchen. The kitchen is fully equipped with stainless steel appliances, a cooking island with gas range stove, and access to both dining areas. The entertainment room upstairs has a flat screen cable TV, a plush sectional, and access to the balcony. The Master bedroom is upstairs, with a king bed, ensuite bath, walk-in closet, flat screen TV, and French doors that open to the balcony. The second upper bedroom has two queen beds, a flat screen TV, and ensuite bath. Next to it, the third upper bedroom has a study, king bed, ensuite bath, and French doors that open to the balcony. The fourth bedroom can be accessed downstairs through the living room, and has a king bed, exterior access, a flat screen TV, walk-in closet, and an ensuite bath. The fifth and sixth bedrooms sit on opposite sides of the entryway, both with two queen beds, an ensuite bath, and walk-in closet. Guests at Yellow Bear Villa have access to the resort’s golf course, tennis court, horseback riding, fitness center, and spa. Adults can request babysitting services and a private chef to make their stay as blissful as possible. The beach, golf club, spa, and tennis courts are all within a 5 minute drive from the villa. The beach at the Punta Cana Resort is 8 mins away by golf cart.